Ready to Fly! 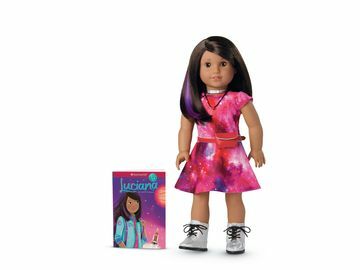 American Girl's 2012 Girl of the Year McKenna Inspires Girls to Face Challenges with Spirit and Determination | Mattel Inc.
MIDDLETON, Wis.--(BUSINESS WIRE)-- This January, girls everywhere will flip for McKennaTM, American Girl's new 2012 Girl of the Year®. A determined, energetic girl who loves gymnastics, McKenna shines on the balance beam, but when she falls behind in school, she must use her strengths to turn challenges into triumphs. Through McKenna, girls will discover the power of believing in yourself and your potential to achieve great things. Written by Mary Casanova, the 2012 Girl of the Year books, McKenna and McKenna, Ready to Fly!, introduce readers to McKenna Brooks™, a skilled gymnast whose confidence tumbles when she starts having difficulty with reading comprehension—an issue affecting many children as they enter fourth grade. With the help of her tutor, McKenna learns to bring the same focus and determination she uses in her gymnastics training to improve her reading skills and get her grades back up. As McKenna's self-assurance deepens, so does her desire to help her friends to face their own challenges. The nonfiction section in the back of the McKenna books features questions and advice from real girls on overcoming obstacles in the classroom and beyond. To explore their own special talents, girls can participate in the McKenna's Take the Challenge! strength-finding quiz at americangirl.com/girloftheyear. Upon completion of the quiz, girls will discover their top three strengths out of a possible eight categories, such as Music & Rhythm, Math & Numbers, and Nature & Animals. After completing ten fun offline challenges that correspond to a particular strength category, girls will receive a trophy. And for each trophy earned, American Girl will donate 25¢ (up to $50,000) to Save the Children's U.S. Literacy Program. American Girl is also introducing a companion book to the McKenna series, Take the Challenge: Crazy Challenges and Silly Thrills to Explore Your Talents and Everyday Skills. The non-fiction activity book is filled with more than 100 challenges, including brain-building games, timed tasks, crafts, and quizzes, to help girls improve their skills and boost their self-confidence. 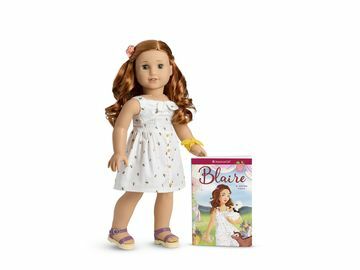 Starting on January 1, 2012, the McKenna doll, books, and accessories will be available for one year or while supplies last through American Girl's catalogue, at americangirl.com, and at all American Girl retail locations. To request a free American Girl catalogue, call 1-800-845-0005. American Girl Brands is a wholly owned subsidiary of Mattel, (NASDAQ:MAT) (www.mattel.com), the world's leading toy company. Since American Girl's inception in 1986, the company has devoted its entire business to celebrating the potential of girls ages 3 to 12. American Girl encourages girls to dream, to grow, to aspire, to create, and to imagine through a wide range of engaging and insightful books, age-appropriate and educational products, and unforgettable experiences. In meeting its mission with a vigilant eye toward quality and service, American Girl has earned the loyal following of millions of girls and the praise and trust of parents and educators. To learn more about American Girl or to request a free catalogue, call 1-800-845-0005, or visit www.americangirl.com. Save the Children's U.S. Programs works to break the cycle of poverty and improve the lives of children by ensuring they have the resources they need — access to a quality education, healthy foods and opportunities to grow and develop in a nurturing environment. When disasters like hurricanes and wildfires strike, Save the Children is among the first on the ground ensuring the needs of children are being met. Save the Children's early childhood education, literacy, physical activity and nutrition, and emergency response programs reached more than 140,000 children and families in the United States last year alone. For more information, visit www.savethechildren.org/usa.